Based on real events in 1970s Colorado, a black police officer joins the KKK. My wife and I watched this at home on DVD from our public library. 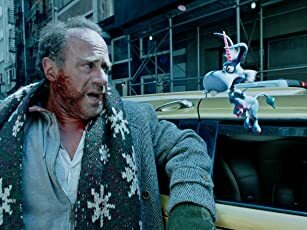 Although it runs a bit long at just over 2 hours it is such an interesting story, well-told, that it never seemed too long. 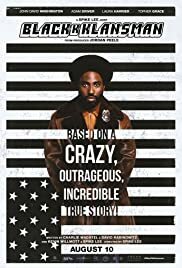 The whole story is based on the 2014 book by Ron Stallworth, of his experiences in the 1970s in Colorado Springs as a fresh police officer, and the first black man to that position in that city. 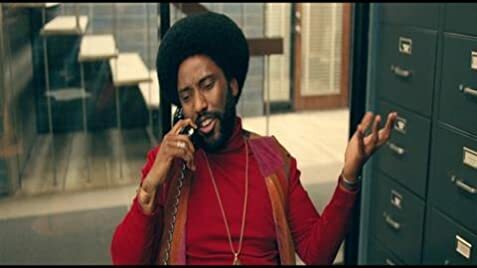 The character is very well played by John David Washington. In real life Stallworth had been an achiever in high school and wanted to make a difference as a police officer. On a whim he notices an ad which was recruiting members for a new KKK chapter in the Colorado Springs area. Having a phone voice and speaking manner not easily identified as black he successfully applied for membership, and at one point even speaking directly to David Duke in New Orleans. Ron would not have gotten very far in his ruse without a white man to replace him in live encounters, for this he recruited the help of fellow police officer, Adam Driver as Flip Zimmerman who happened to be Jewish, another ethnic target of the KKK. Together they thwarted some serious KKK mischief planned. For a very serious subject the movie director Spike Lee injects a fair share of humor, all very appropriate. Near the end the events of the 1970s are intercut with modern events and protests, showing that white supremacy activities are far from over. 91 of 135 people found this review helpful. Was this review helpful to you?